There are plenty of options out there for sliding glass doors, but people don’t always know how to cover other types of windowed doors. 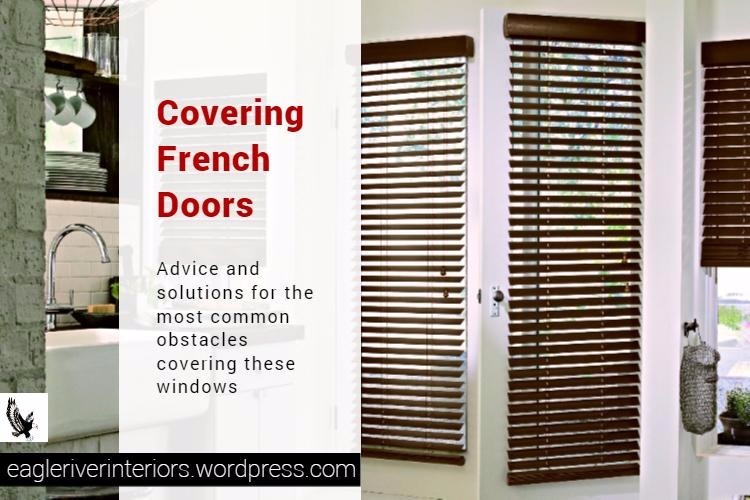 A frequently asked question is how can I cover my French doors, Dutch doors, really any door with a window that isn’t a slider. All these styles face a similar set of problems. If you’re a family of door slammers consider a soft covering. The sound of bang bang bang from wood blinds hitting against the glass can wear down the nerves fast! For your average door user this won’t be an issue. Many new styles have a clips or magnets to hold the bottom of the covering in place when it is lowered, this will keep it from flapping around when the door is opened and closed. 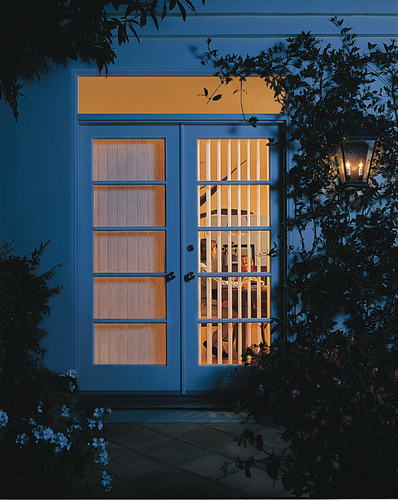 Shutters are an option that are fully connected to the door, making door movement a non-issue. How far out the lever comes out from the door can limit the window treatment can be. If the lever is close to the door this can limit you to certain styles. If you are in love with a certain style an option is to change out your door handles to a more accommodating style. 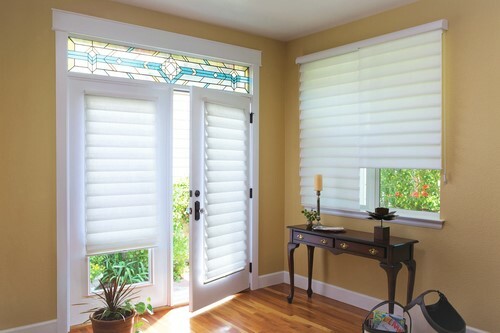 Window coverings with smaller folds, pleats, or veins are usually less likely to interfere with the door handle. This (literal) workaround is normally seen with shutters. Leaving a cutout for the handle highlights the custom look of the window treatment. 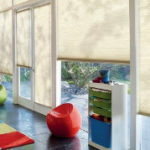 It also lets you use this sturdy style window covering that would otherwise be prohibitively thick to fit under the handle. 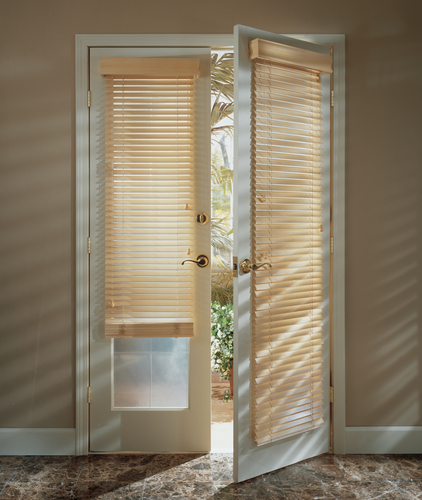 Shutters solve the door movement and door handle problem in a really efficient and elegant way. Where they do struggle is thickness, the third main issue of French Doors. Doors on windows lack the depth we see on other windows. With windows that are set back into the wall we can fill that depth with the covering. An inside mounted covering gives the illusion that the window covering is less thick. When you put the same treatment on a door it sticks further out than the door and the surrounding walls, making it look thicker and bulkier than it did on the window. This is usually just cosmetic, so if it doesn’t bother you great! If it does bother you then you’ll just want to look at some slimmer options. the slimmer options are going to be similar to the “going under the handle” options. 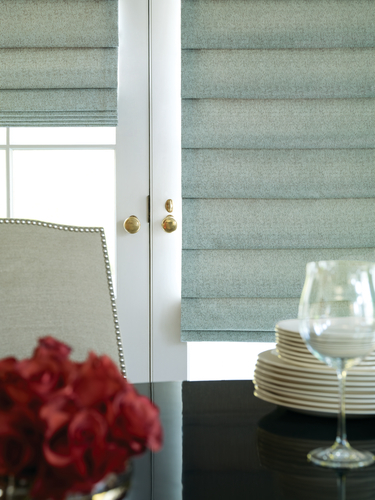 Window coverings with smaller folds, pleats, or veins, or you could consider a flat style like roller shades. 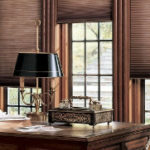 Vertical window coverings and curtains can be a good option for most tricky to cover windows. Being able to draw your window coverings off to the side when the doors are in use keeps them out of the way, and out of trouble. Certain room layouts can prohibit this because there isn’t room along the sides of the doors to have the vertical coverings/curtains rest. If this is the case for you then a covering mounted on the directly on the door will be your best option. 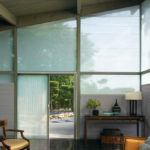 If you still aren’t sure what the best option is for covering your doors ask your local window covering expert! This is the kind of thing they specialize in, their experience with awkward to cover windows can be invaluable. If you in the King County area of Washington you can come into our showroom. Designers really are are problem solvers. If you have a problem with an uncovered French Door, we can solve that.